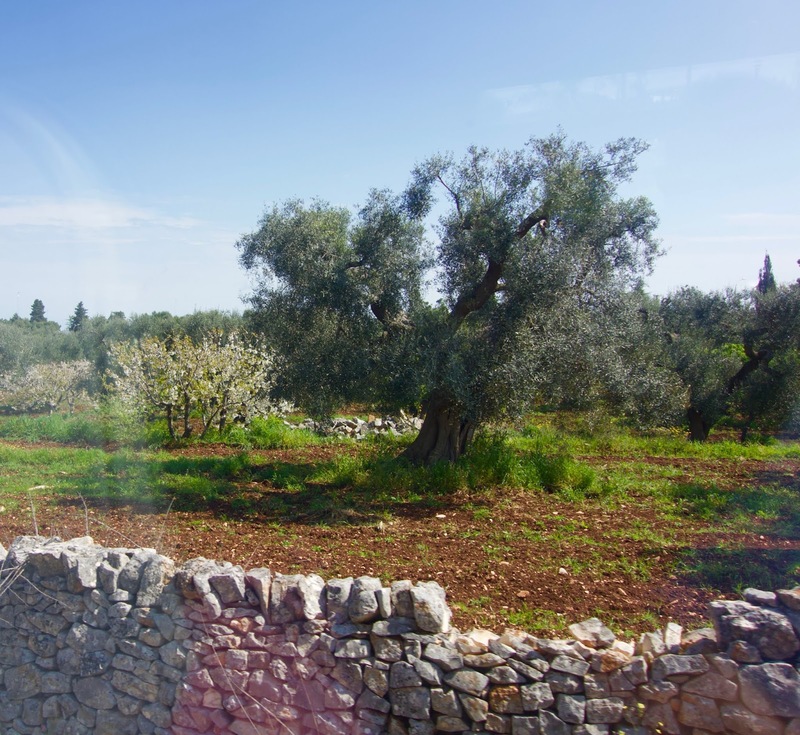 The train trip from Bari to Alberobello takes about 1hour and 40 minutes. The trick is, finding the right ticket office. Alberobello seemed like a good destination to slosh down some wine and see the trulli, those pointy roofed houses found only in this part of the world and one of the main tourist attractions in the Bari area. 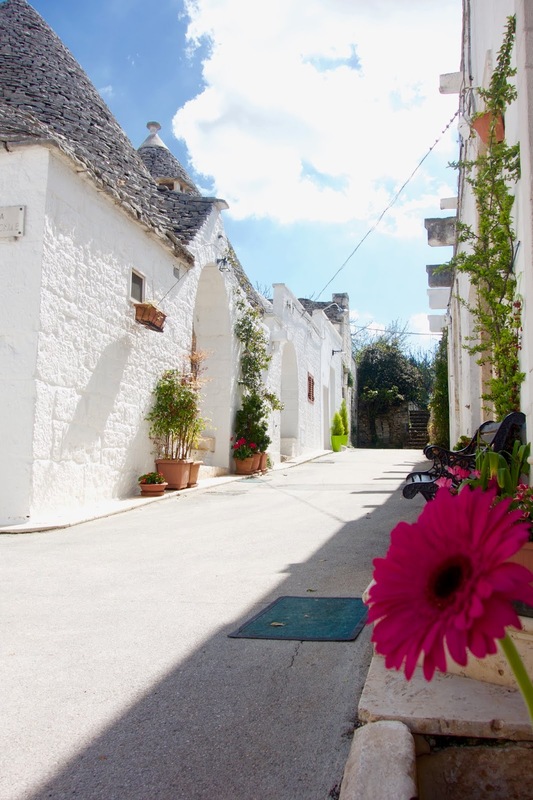 Alberobello is also a UNESCO world heritage site. Good news. Trains leave every hour. Tried the main train station. Uhhhhh…no. A kind ticket clerk sent us across the way to another ticket office. High hopes, but this was also a losing lottery ticket. Another kind ticket clerk sent us next door to a café. Really? Yep, you go through the café, down a hallway and a small office on the right sells the tickets. The ticket seller also told us platform 11 was the one we needed. We purchased round trips, just in case there were two or three ticket offices at the other end. More trouble. We walked the entire length of the hallway, with stairs clearly marked for each platform. No platform 11. Was this to be like Platform 9 ¾ from King’s Cross Station to Hogwarts? Wait a sec, there’s a stairway at the end of the hallway that leads outside. We took the stairs to the right. Nothing, but a sidewalk and a busy city street. Let’s try the stairway on the left. Presto. Kinda. With blind luck we walked up the stairs to the outside and found another open doorway that lead to platform 11. 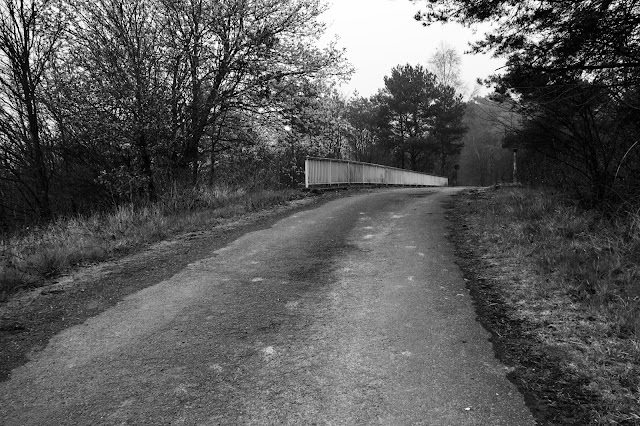 Nothing marked, but everyone else seemed to be headed that way. Not only safety in numbers, but truth in numbers. But, was this the correct train? Perplexity so close to success is no more comforting than almost passing a final exam. Several Italian passengers seemed as perplexed as we. For the record, one of our company was fluent in Italian. We milled about. We stepped toward the train, then backed away. Finally, a pretty young woman assured us this was the correct train to Alberobello. Audible sighs of relief. A herd of equally perplexed folk boarded with us. Ah, the sweet bliss of discovery, the comfort of the lost and confused being rescued. The train was clean and comfortable. We chatted and waited for the conductor to grab our tickets. Never happened. 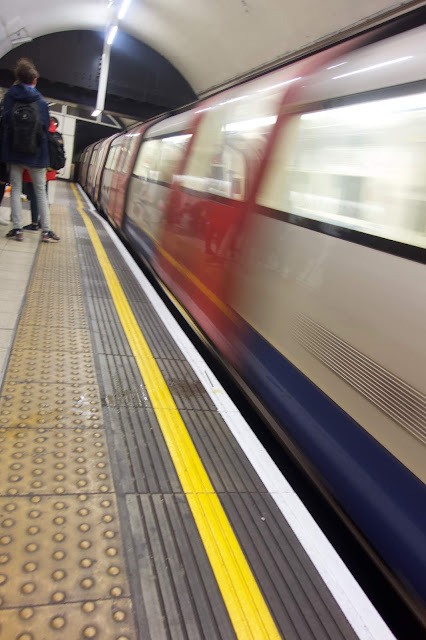 Like the London subway system, tickets are checked at automatic turnstiles at the end of the journey. It was nearing lunchtime when we hit the pavement at Alberobello, but despite our eagerness to find the trulli, we stopped for wine. But, some broke ranks and went for gelato. As we sat and sipped or licked, we noticed a tall tourist pulling out one of the stones from the roof of a trullo. “What the……..???? Has he lost his mind?” Apparently he had. He replaced the stone and pulled it out again…and again. 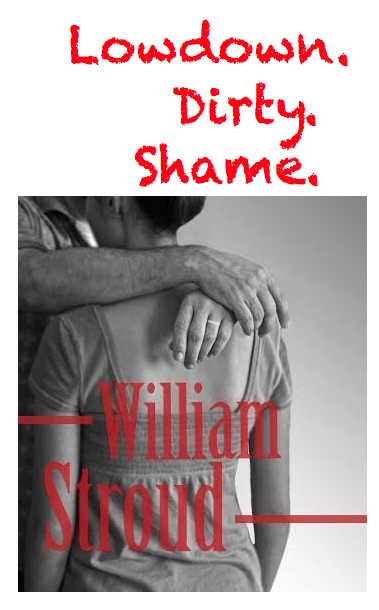 Then his equally mentally decrepit wife showed up and he couldn’t wait to show off his new talent. Just as all four of us were about to race over and make a citizens arrest, he and the wife wandered off, possibly to find another roof. 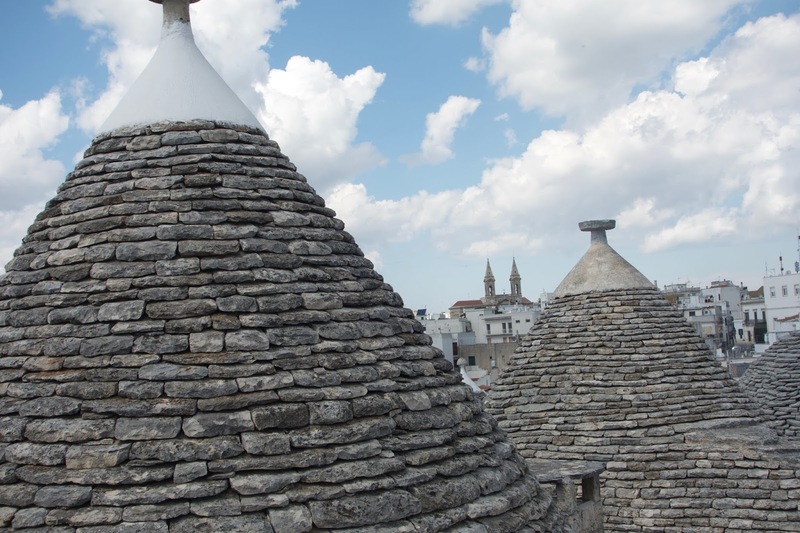 Trullo or trulli requires a bit of explanation. 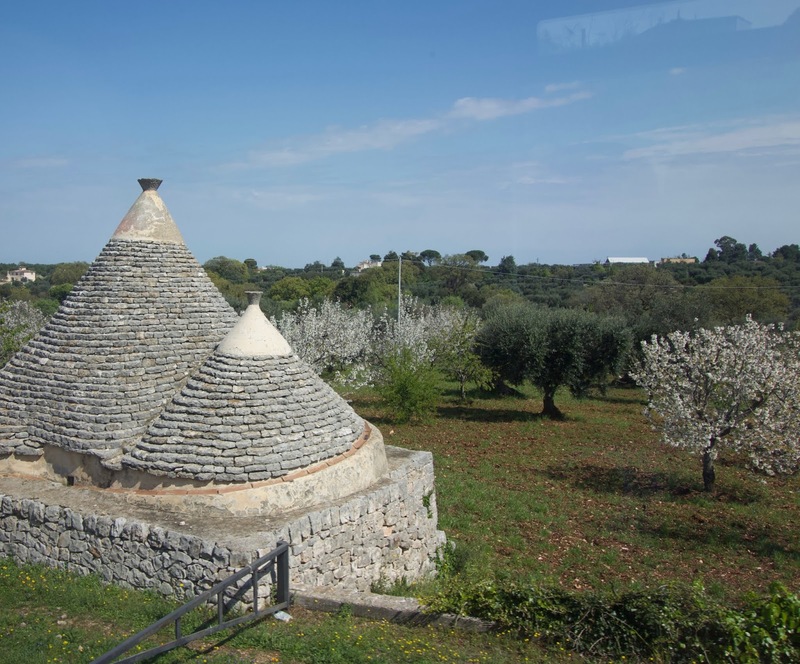 Trullo is singular. Trulli is the plural. But, due to Tourist ignorance and the abundance of these dwellings, the whole place is often referred to as Trulli. 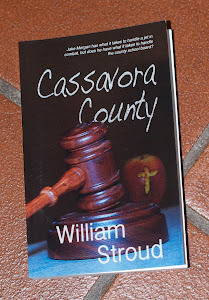 As we noticed, gazing out the windows of the train, this is rocky county. Lots of low stonewalls, with white rocks scattered like popcorn in the vast open fields. 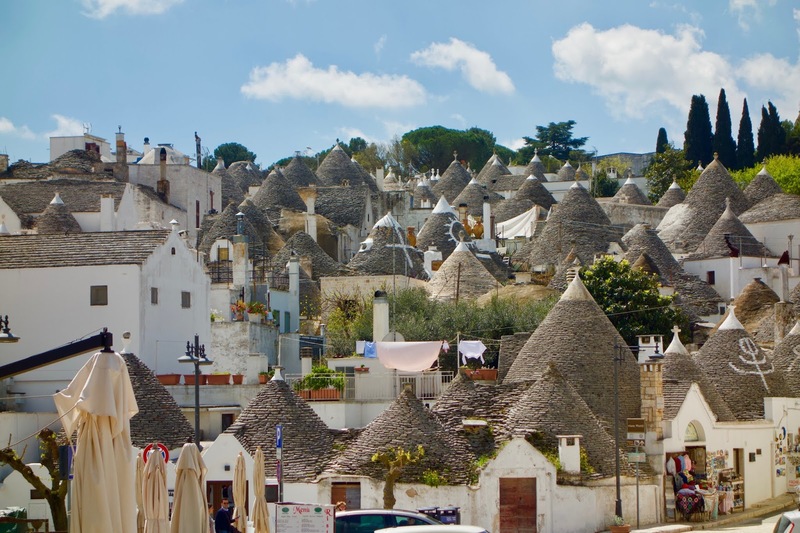 As you might imagine, the trulli are also constructed of stone, mostly round, but the occasional four sided abodes, but all with conical roofs. How in the world did this get started? Well, back in the bad old days of the 15thCentury, when King of Naples dictated that any new settlement was to be taxed, the peasants of this area…who may have been poor, but not stupid…..began building houses that could be quickly disassembled. 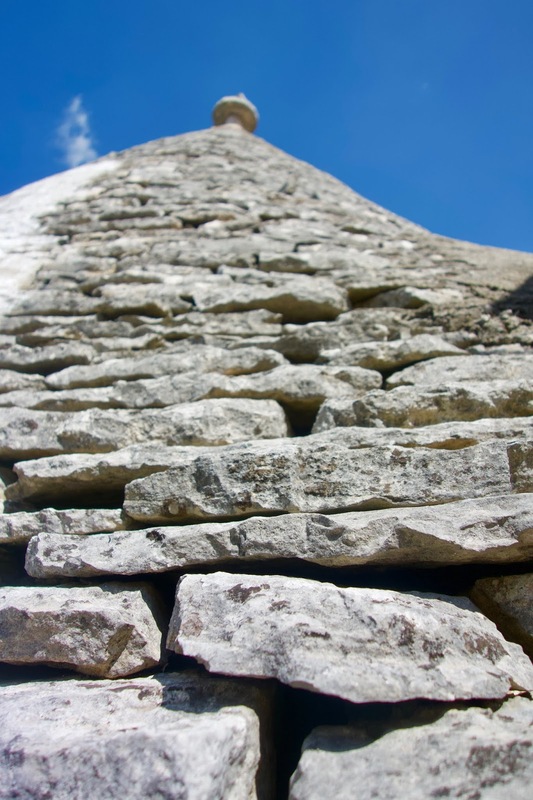 Stacked stonewalls, without mortar, and roofs that were also stacked. 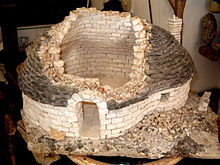 The interior layer of the roof was built using voussoir technique and an outer shell of stacked sandstone, pointed slightly downward, much like stone shingles. As the tourist so kindly demonstrated, the roof tiles are not mortared either. Now, I suppose you are dying to know what voussoir means. Wedge shaped stones that when properly fitted together to form a dome, press on each other and do not collapse. The Romans used the same technique on bridges and aqueducts. (see illustration). At the top of the a trullo roof ,the builder almost always put a carved bit of sandstone, as a capstone and also as a bit of advertising. The trullis do not normally have windows, but there is a vent on the roof. You’ll notice the white walls are now smooth. 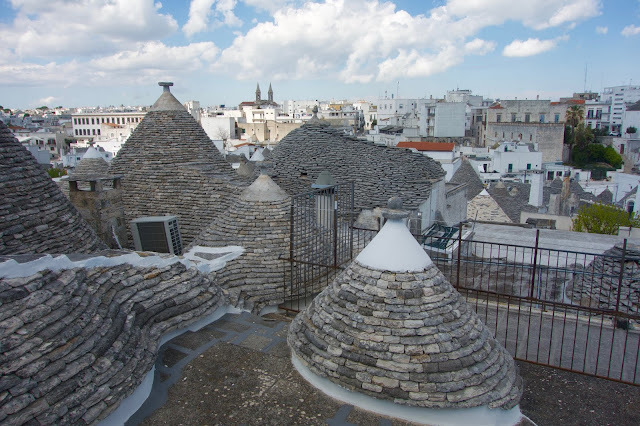 In follow-on centuries, when life was a bit more certain, trulli began to have the walls, inside and out, plastered and painted. 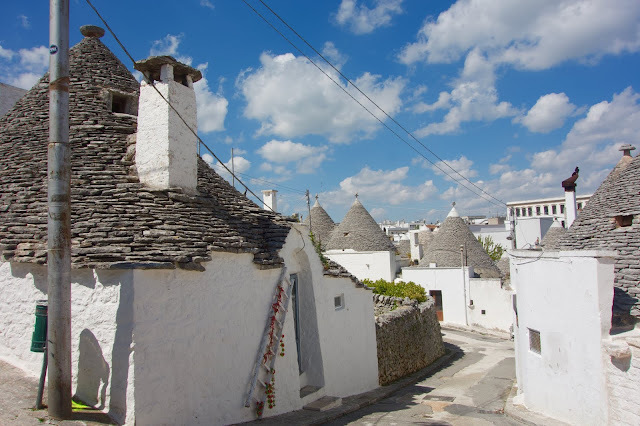 All the trulli we saw in Alberobello were painted white and also had Christian symbols painted on the roofs. However in the countryside those trulli, that served for livestock or grain storage, were still bare stone. Some people still live in the Alberobello trulli. You can tell by the newly installed windows and doors. 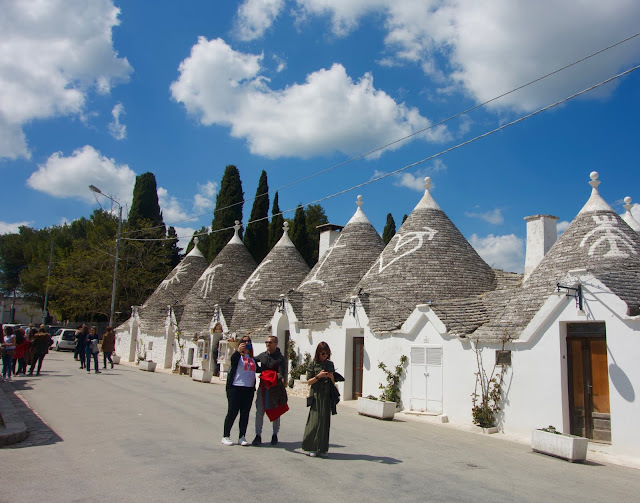 Other trulli have been converted to shops that sell trinkets, ceramics, baskets, and hand woven table linens, as well as paintings and statues. 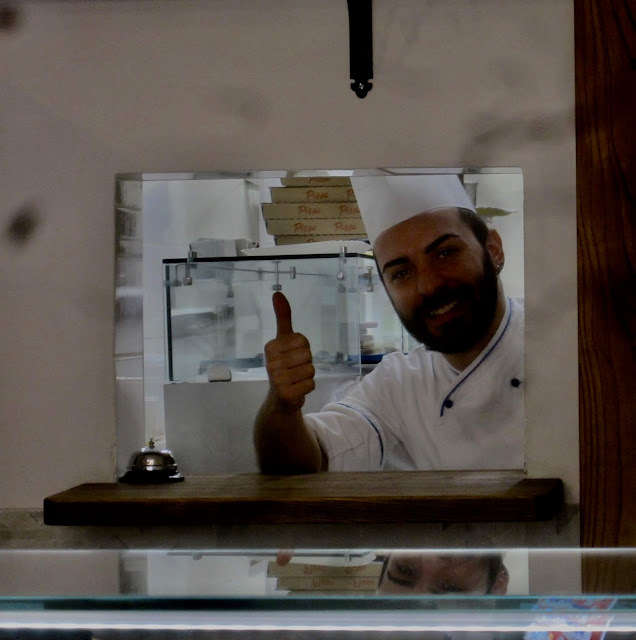 One thing we all noticed, the people of Alberobello are cordial and friendly. I’m not just talking about the merchants, but everyone. Makes for a nice visit. And by the way, the wine was delicious. 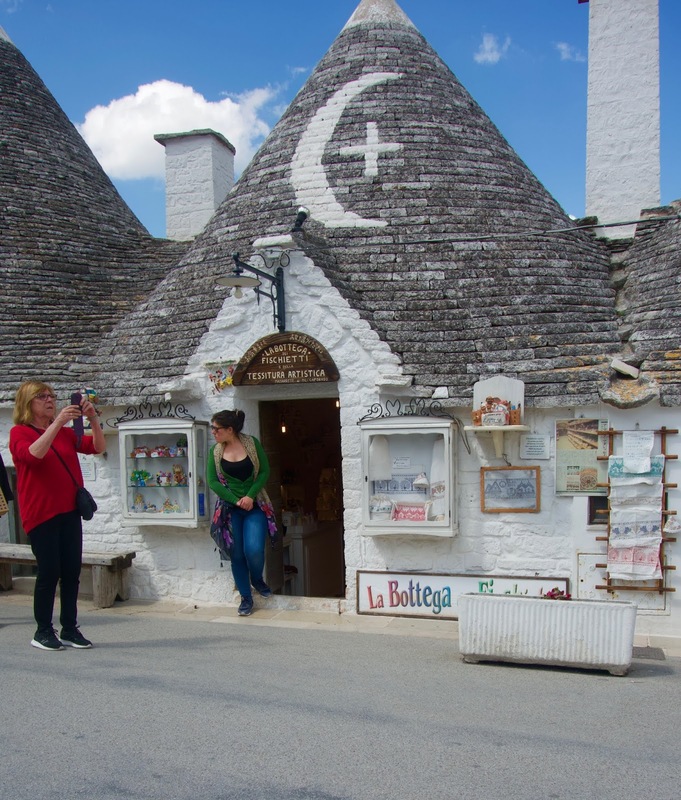 We trulli enjoyed ourselves. Appreciate serendipity? 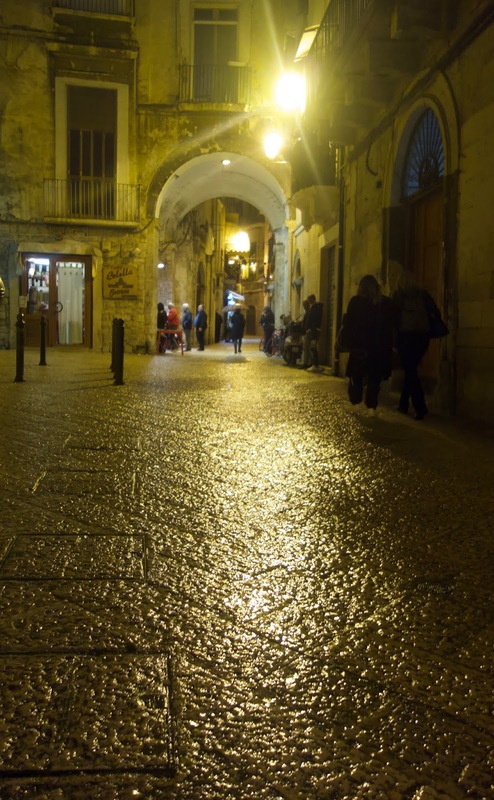 Walk down the street with me in the scenic city of Matera, Italy. Let’s pop into a sidewalk café and find joyous folks who love what they do and do it well and …and turn your afternoon into a pleasure. Found one! 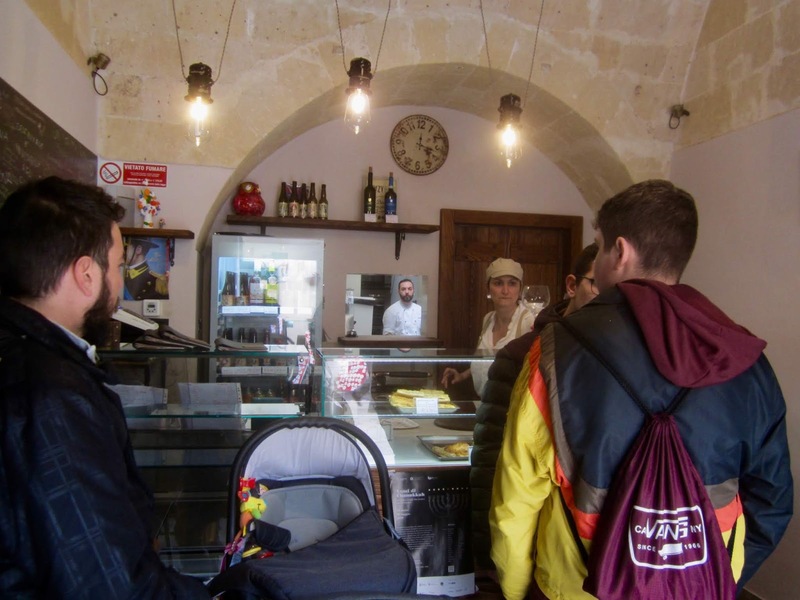 Il Rusticone, near the old part of Matera. 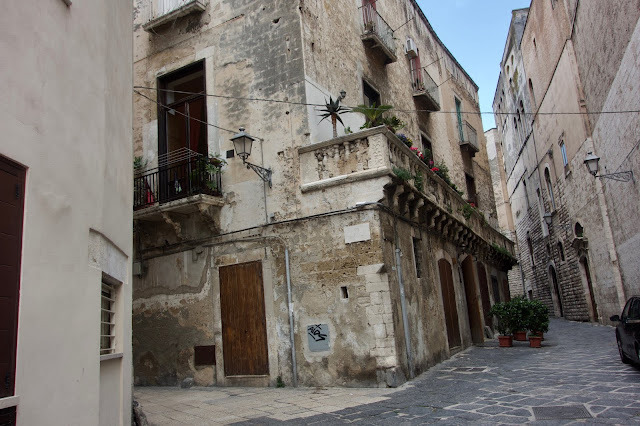 We got off the train, knowing little about Matera except it’s a national treasure of a town (Sassi di Matera), with a Troglodyte (cave dwellers) heritage that goes back possibly 6000 years. Plenty of time to write about that later. Right now let’s stick to eating and drinking and counting ourselves lucky to have found some fabulous street food at Il Rusticone. Step through the door and Veronica greets you with a smile as bright as the Italian sun, even with a drenching rain making the old stone pedestrian street shine like glass. You don’t have to speak a word of Italian to know you’ve come to the right place. It’s almost as if Veronica were welcoming guests to her home. 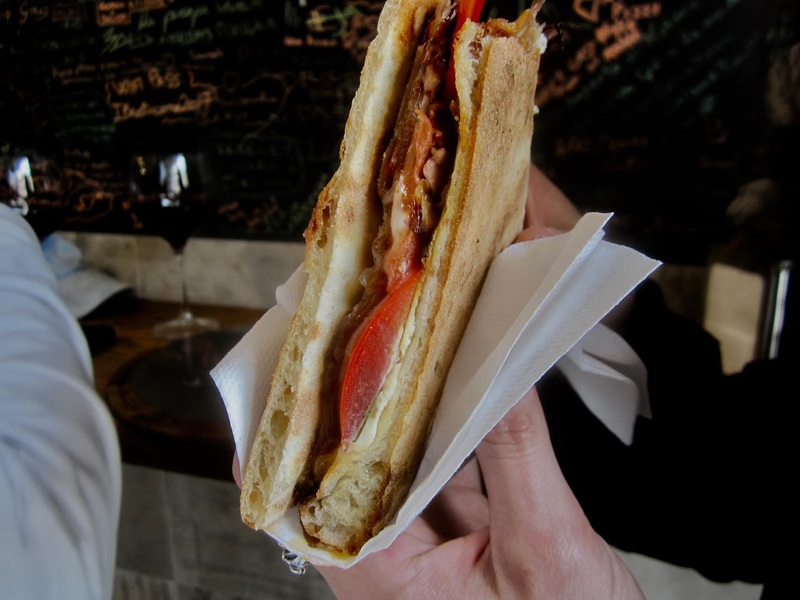 Although Il Ructicone offers a variety of selections, the four of us opt for sandwiches, with puccia, the local flat bread, toasted to a wonderful crustiness and filled with locally produced, naturally cured ham and bacon, cheeses and vegetables. Huge portions, which alone is not important, but when the bread and fillings grab your taste buds, they don’t let go. Conversation comes to a halt. By the way, puccia is sandwich bread made from pizza dough. 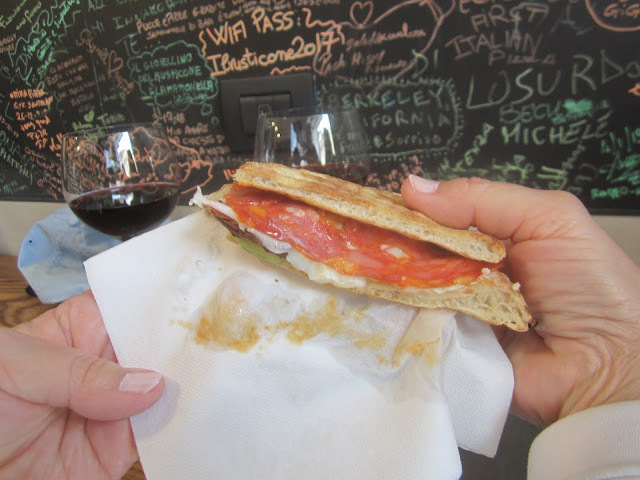 But in Italy, lunch, even a street food lunch, is simply not eaten without wine. Of course we picked a local vintage. Veronica offered others, but her face lit up when we went local. Super choice! 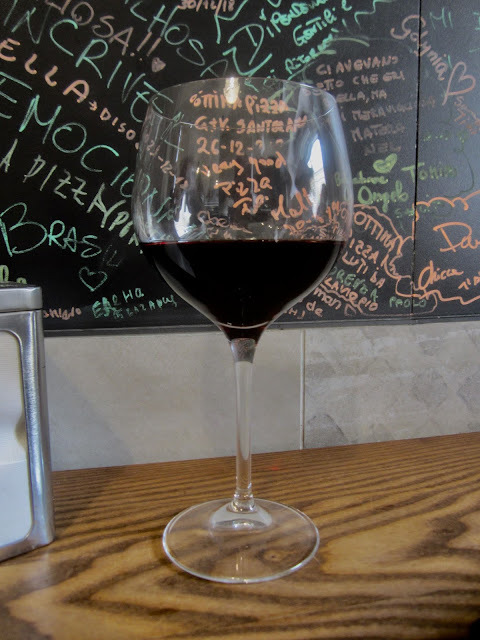 The wine was rich and dark, with a fruity nose and such a round, romantic finish! So you may well ask, what the hell is a romantic finish? Well, you see, counting Veronica, I was surrounded by four beautiful women, all of us drinking this nectar from the vineyard. We laughed, we joked. I asked if they wanted more wine. They all said, “Hell, yes!” See these four were not only beautiful, but also earthy. Only Veronica didn’t drink, but she had to do the pouring, which she did with such a wonderful flourish, I just couldn’t take my eyes off the round, fully formed goblets. Ah, wine goblets! She couldn’t stop speaking with us and although I could barely understand, her smiles and laughter were the real things. Fortunately, two of my companions, the English mother and daughter I wrote of earlier, speak Italian, the mother fluently. 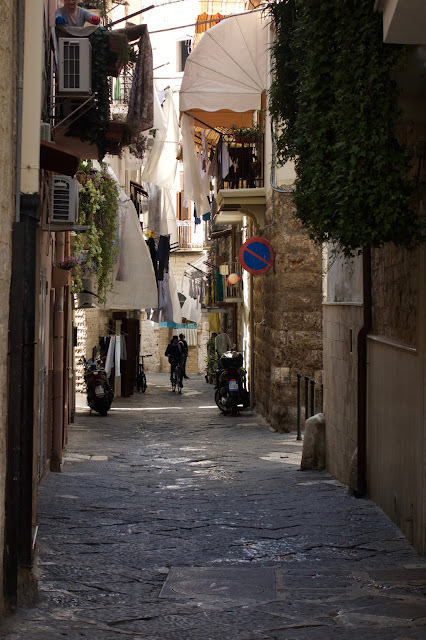 When it was time to visit the Troglodyte (and younger) parts of the city, we had to talk each other out of staying right were we were. After all, it was drizzling outside and Veronica clearly had more wine…. 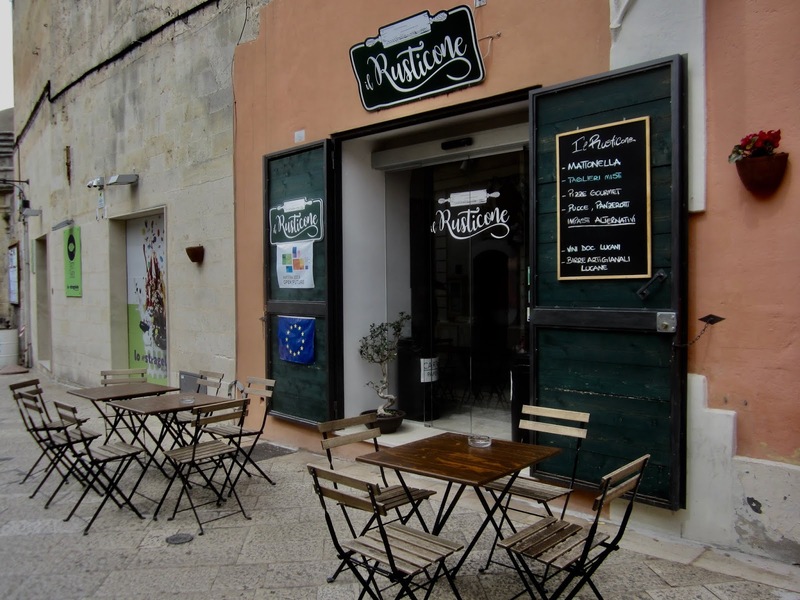 Should you ever get to Matera, whether it’s raining or not, drop in on Veronica at Il Rusticone to treat your inner Italian to the puccia and the luscious local wine! What’s that? You can’t make it? Well, as an alternative, hop on the web site and eat your heart out! A quick note on the wine: Made from Aglianico grapes grown on the eastern slope at the foot of the extinct volcano, Monte Vulture. 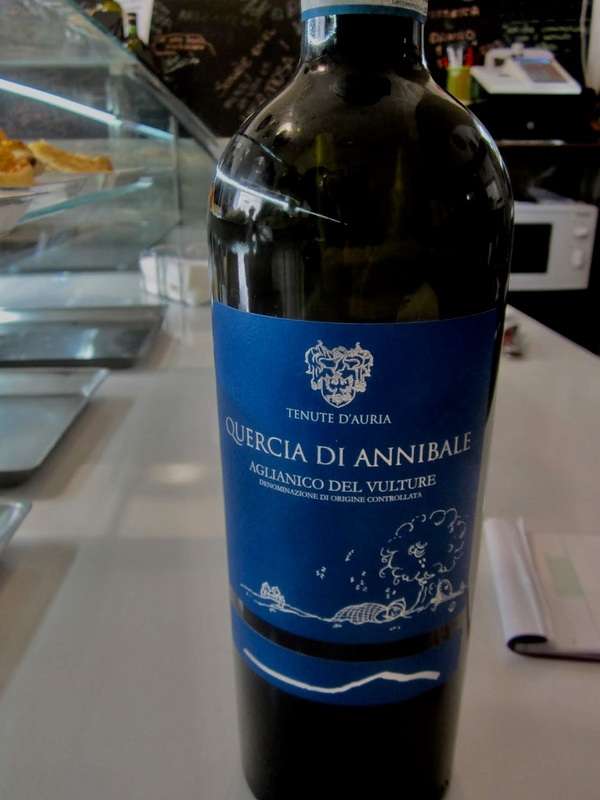 The Tenute D'Auria vineyard is only about 25 acres, 10 hectares. Not sure if it's available in the U.S. Such a small vineyard! Of course, one must visit the Italian usuals, Rome, Venice, Florence, Pisa, the Vatican. Vatican City, although surrounded by Rome, is not Italy, but it’s own country. 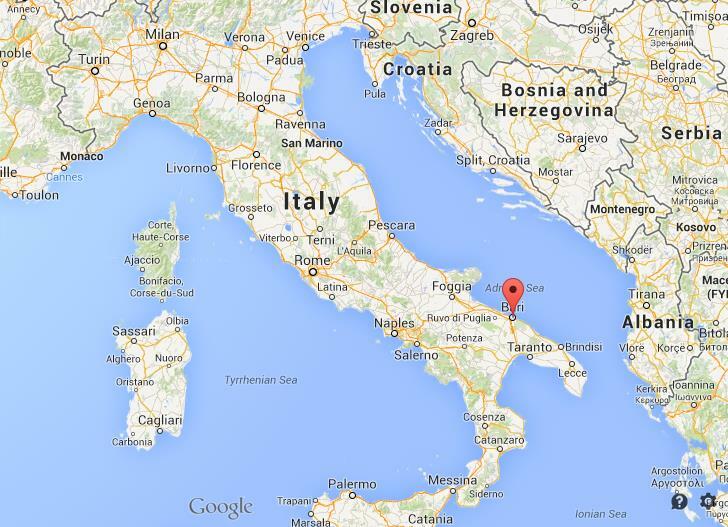 Did you know the Papal States once included the entire middle of what is now Italy? Nevermind. Let’s move on. I don’t deny all the popular spots are worth a trip, but sometimes I enjoy getting off the well-trod path and wander in lesser known locales. Nope, not talking about living in a tent and subsisting on yak milk, or spanning the Andes until I have no soles left on my hiking boots. After all, we must be civilized, showering everyday, eating with a knife and fork on occasion, and sharing a bottle of wine over candlelight. 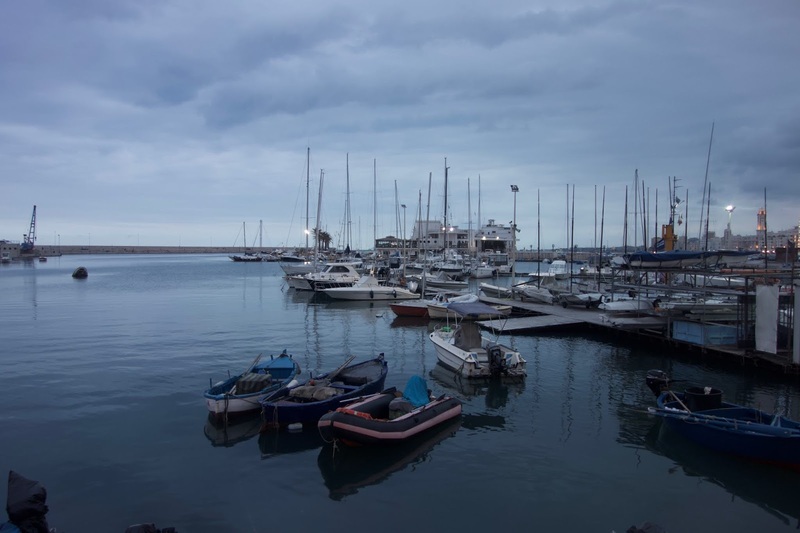 This time, getting off the well-trod trail meant flying to Bari, Italy and staying in proper accommodations, with a night cap of a well-mixed Manhattan. Why did we pick Bari? 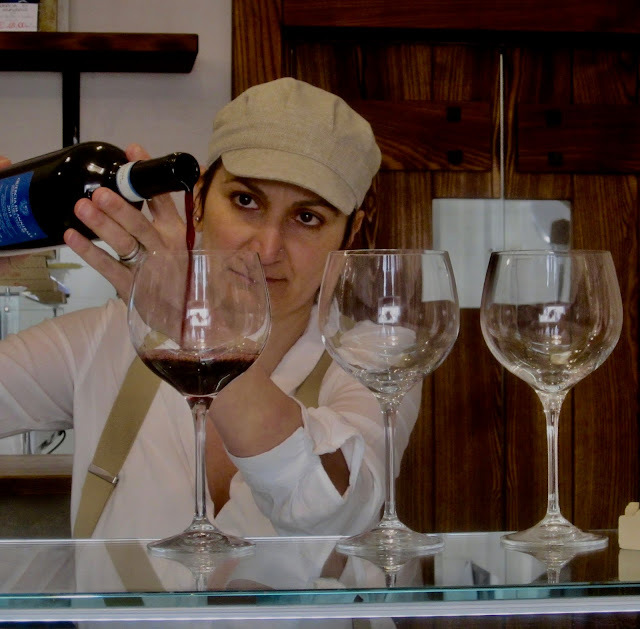 Puglia (pronounced Poolya) is the area that produces our favorite wine: Primitivo. More about Primitivo in another article. But as soon as we got into the city, things changed. The princess kissed the frog. Beautiful architecture, enticing restaurants, tall palm trees, and broad boulevards gave my hopes a boost. 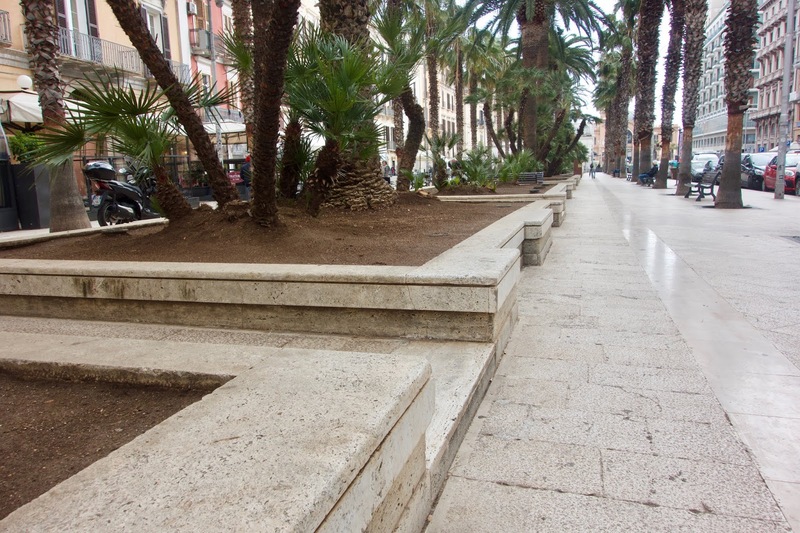 Modern Bari, as attractive as it is, doesn’t begin to tell the city’s sometimes dark and far reaching story. Wars. A long long list of rulers. Even the crusaders passed through. 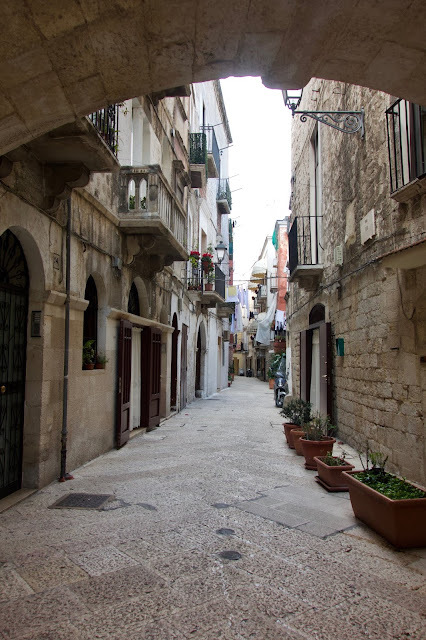 As in so many places in Europe, Bari has history piled on history. It’s not like peeling an onion. More like a twenty-foot high layer cake. But since a stack of historical dates is as appealing as a fat jockey, I’ll restrict myself to just a few. 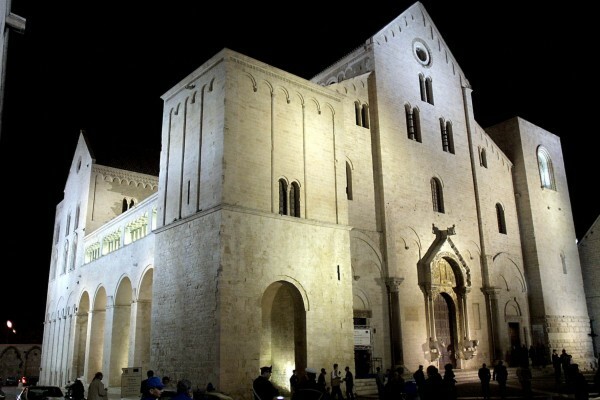 Bari, which the Romans called Barium, but has nothing to do with Ba in the periodic table, is the capital of Puglia. It may have been inhabited since 1500 B.C.E. The Greeks were here. The Romans were here. 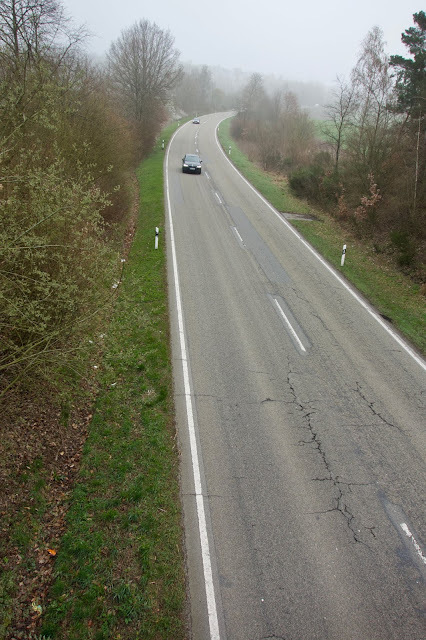 You only have to drive around Europe to find out the Romans were EVERYWHERE! Byzantines ruled Bari for a while. 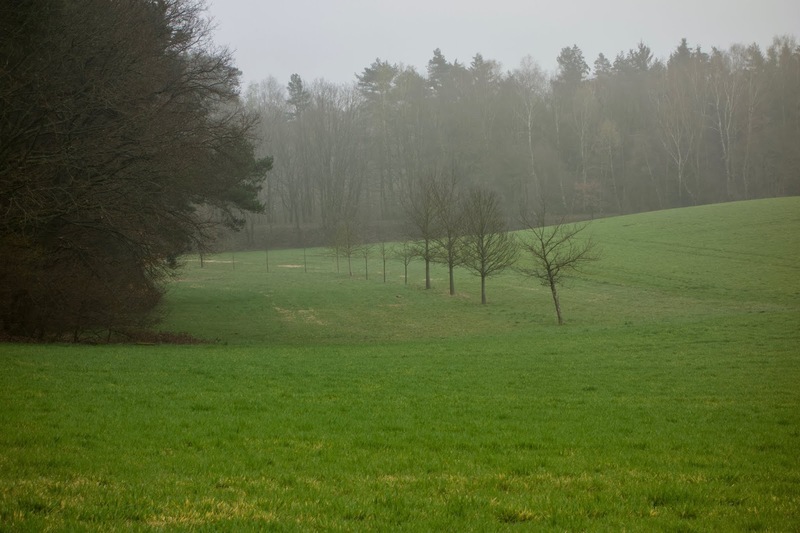 The Swabians, a Germanic tribe, came through, conquering and plundering. 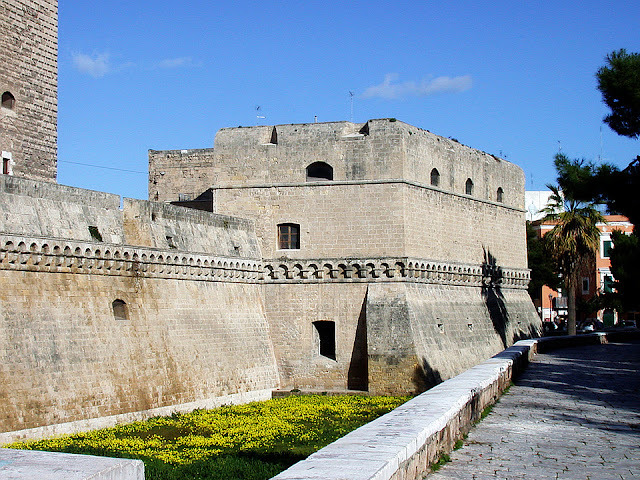 In fact, a Swabian, William the Bad of Sicily partially destroyed Bari Castle in 1156 . I’ve read he got the name from his enemies who were sore losers, not from his mistress who called to him Willie-the-B, with a sly smile and a crack of her whip. The Normans later rebuilt the huge stone castle, which still stands solidly in the heart of the old city, right on the water’s edge. Well worth a visit, as is the Basilica of San Nicola (1087), built to house the relics of St. Nicolas, which had been stolen by Italian sailors from their former resting place in Turkey. 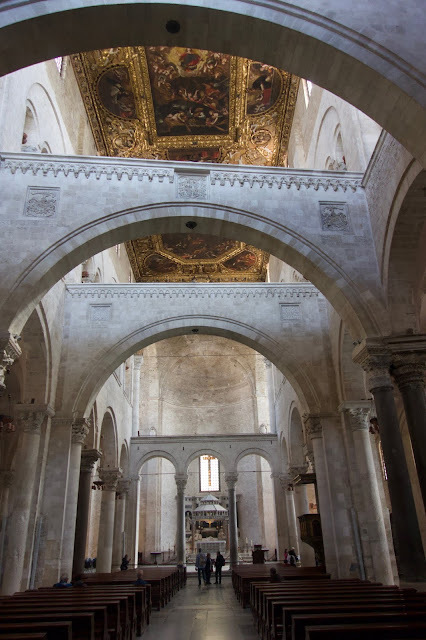 When you visit the Basilica, be sure to look up at the vaulted ceiling. Gorgeous! 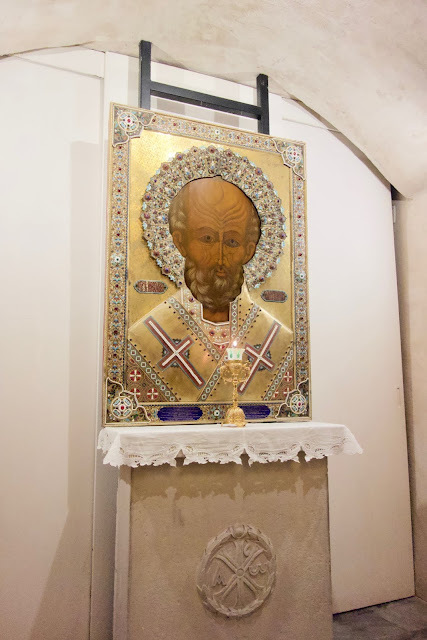 A portrait of the saint. Yes, Saint Nicolas is THAT Saint Nicolas. Interesting to note there is no solid historical evidence he ever existed. But, history leaves out more than it leaves in. 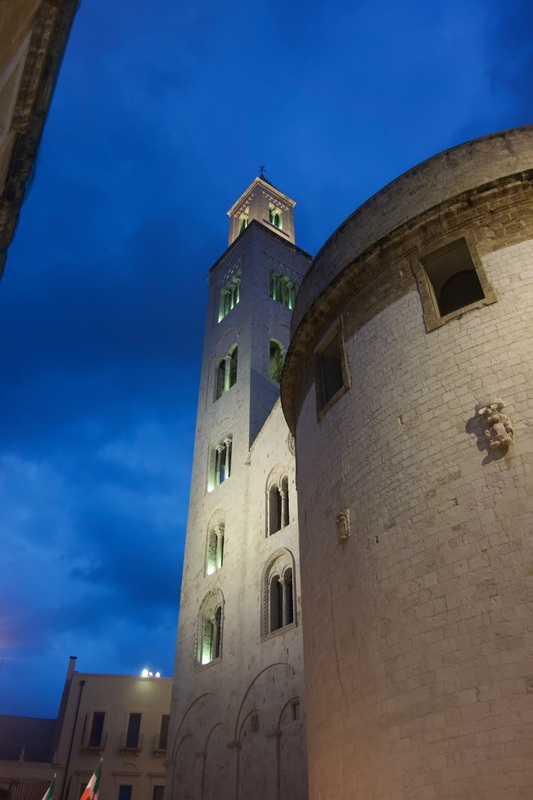 Both the castle and the Basilica of San Nicola are built in a similar style. Boxy. Light colored stone. High walls. Several buildings near the Basilica contain a convent, a museum and other connections to the church. I know you’re thinking: How about more modern stuff? Ok, you win. Bari did not become part of the Kingdom of Italy until 1860. Anyone realize that Italy as we know it was not truly formed until 1918, after Italy defeated Austria-Hungary in the First World War? 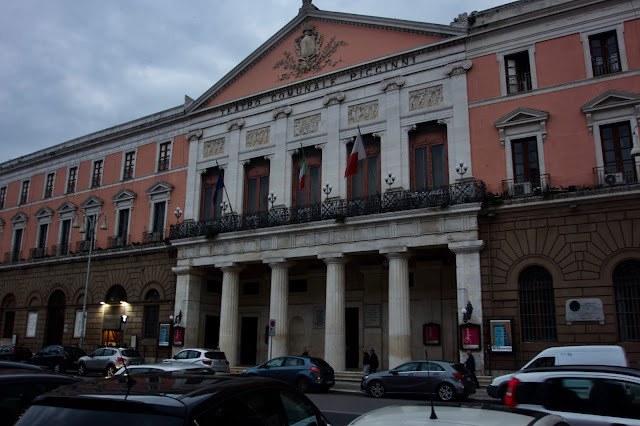 The Teatro Piccinni is a wonderful opera house, also used for ballet and other performances. Although I didn’t watch a performance, I understand the acoustics are superb. Back to the old town. The stone buildings narrow, cobbled streets and clusters of cafes and restaurants in the open plazas make for a fascinating visit. 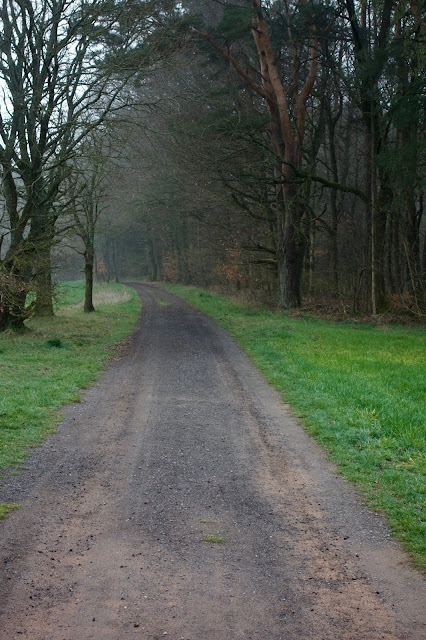 Take a map or a GPS device. Otherwise, you better drop some breadcrumbs along the narrow, twisting alleyways. 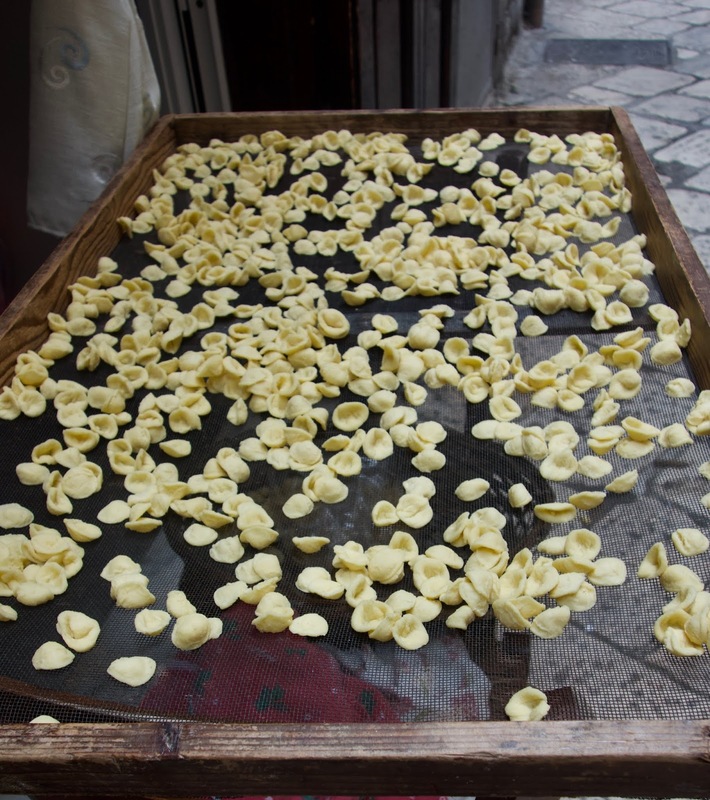 The famous pasta of Bari: orecchiette. 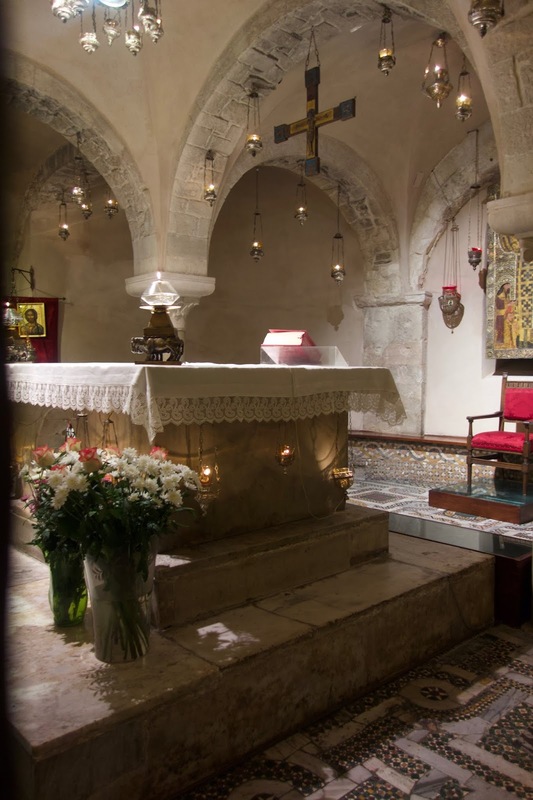 Besides the Basilica of San Nicola there are plenty of other churches to visit. And, on some streets you can watch older women making the famous Bari orecchiette pasta at a blazing speed. The way they cut and form the pasta is one swift motion is incredible. But, for me, the people you meet are far more important than the buildings, monuments, and even…dare I say it….the fabulous bottles of wine. I’m a big fan of serendipity. But serendipity is just a piece of the puzzle of meeting people. Just don’t be too shy. People like to chat. Had a long and interesting chat and tasted a lot of wine at a winery selling Georgian wine.. More to come on that in another blog. Struck up a long conversation with an Australian couple. Politics, economics, investments….we ran the gamut. Fascinating! Two amazing English ladies we met on a train on the way to the city of Alberobello, a unique beauty of a town that I’ll write about in a follow-on article. I call these ladies English, but both spoke Italian, one fluently. Yes, they live in London, but one of them refers to herself as Italian. But, then you know how women lie. They were on an adventure, just as we were, and I soon found out they had the right attitude. We hopped off the train and when I mentioned Wine Time, they grabbed a table at the closest outdoor café. We noshed and sloshed and gossiped and suddenly this was no ordinary trip, but a traveling party! For the next two days, the four of us travelled and partied and explored Bari and all around it. 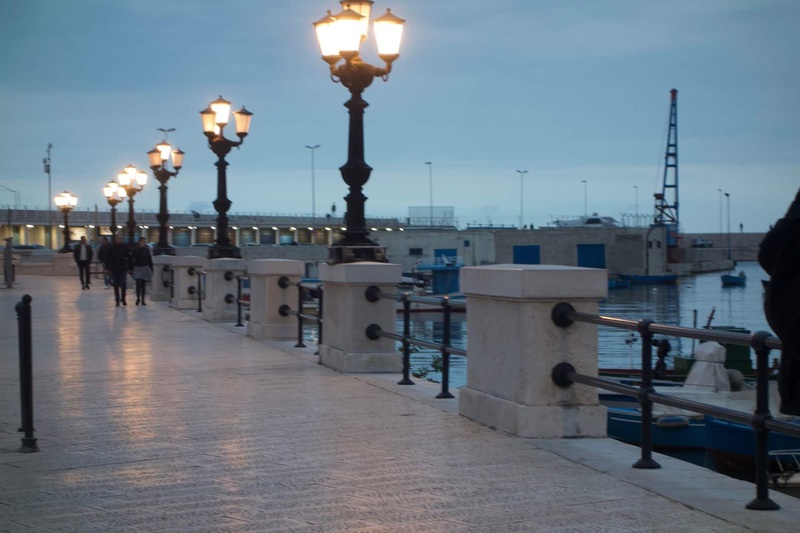 Bari is a seaport and as you can imagine, we filled up on seafood. The best octopus I’ve tasted, tender and succulent. 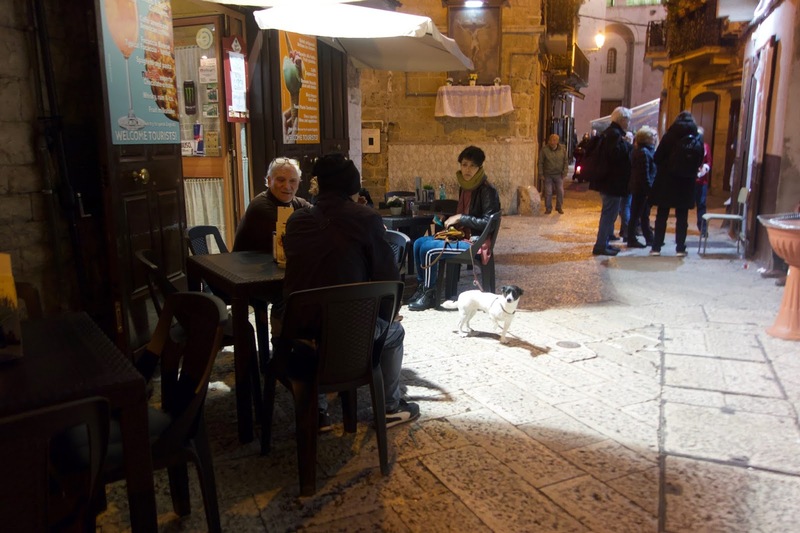 The ladies were staying on the edge of the old city and Italian fluency led them to the kind of enchanting bistros every traveler hopes to find. Yes, I will write about one in the coming days. Yes, I will name the restaurants and show off some wines! 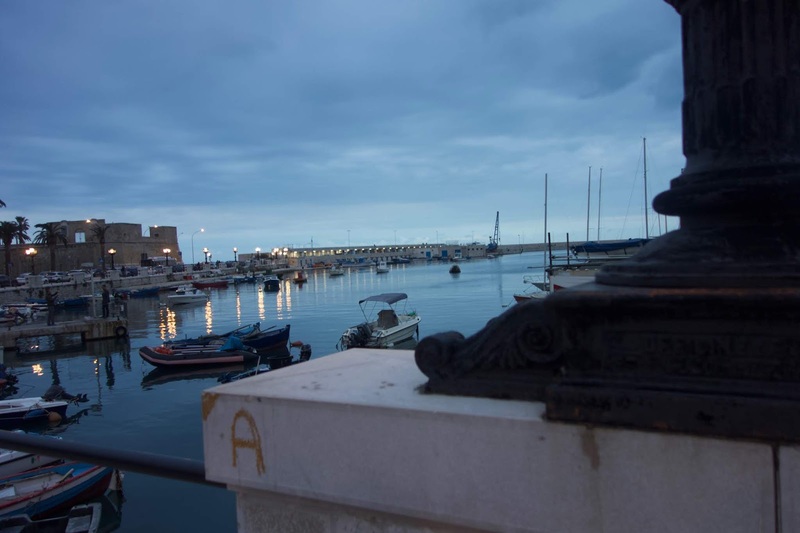 If Bari may have begun on an edgy note, with a taxi ride though ravaged urban detritus that made me face death by a speeding weapon, it also led to a solid few days of exploration and memorable meals, to late nights, wonderful wines and epic camaraderie. So, would I do it again? Just a moment and I’ll tell you. 44 is the country code for the U.K, right? And on across the lawn. To meet the Springtime's kiss. 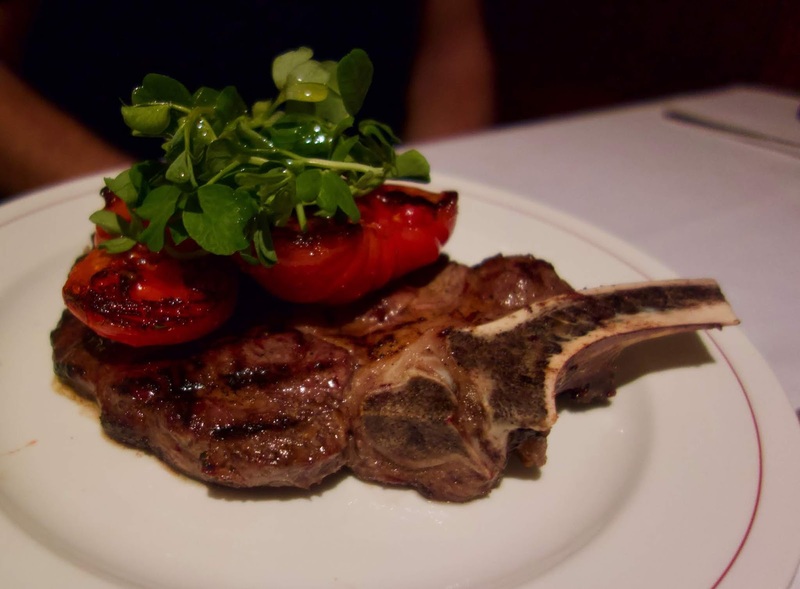 During our sojourn in London, amid the nights of thrilling theatre and the plebeian charm of public houses (pubs), and the wallet emptying time spent at more exquisite drinking establishments, we did manage a few wonderful meals. One of my companions suggested J Sheekeys, catering to late theatre crowds for over a hundred years. 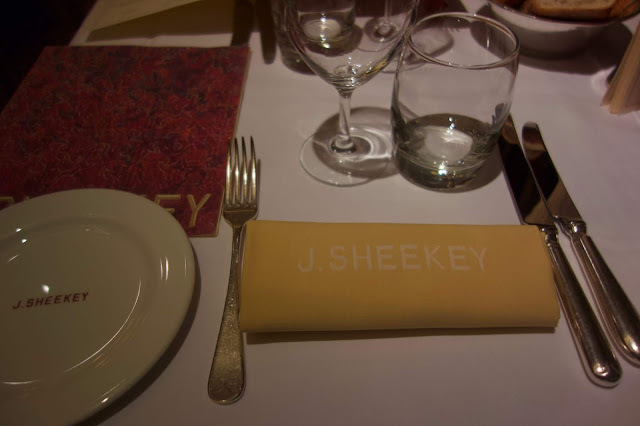 Sheekey’s also has an elegant oyster bar (J Sheekey Atlantic Bar) next door, which, sadly, we did not visit. 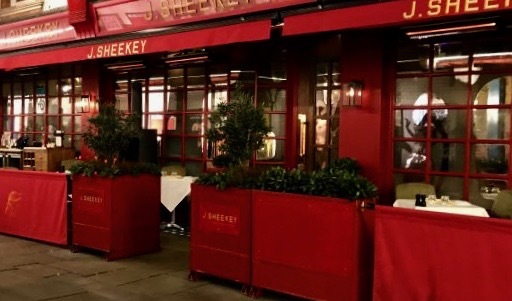 Often described as near Covent Garden, J Sheekey is actually nearer to Leicester Square, in the heart of the theatre district. Besides the food, Sheekey’s has an interesting history. Allow me to take you back to the glory years of Britain, at the height of its powers when “The sun never sets on the British Empire.” But, I need to add a correction. That quote about empire comes from a tome authored by Christopher North, who actually wrote: “His Majesty’s dominions, on which the sun never sets…” The Majesty at the time (1829) was King George IV. But, J Sheekey had a much more humble beginning. 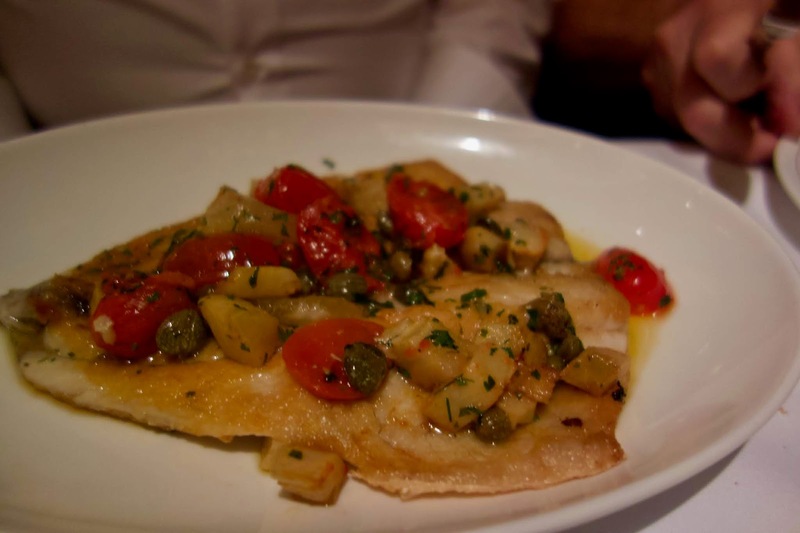 In the 1890s, Josef Sheekey, a fish monger at Covent Garden, asked permission to serve fish and shellfish. 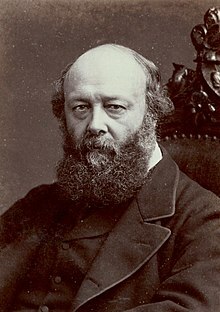 Lord Salisbury, the Prime Minister at the time (he was three times Prime Minister) gave his permission, but with the proviso that Sheekey would supply food for Lord Salisbury’s late, after theatre dining parties. And who was the Monarch at the time Sheekey’s was born? Queen Victoria (Queen 1837-1901), the longest reining British monarch until the present Queen Elizabeth II. You see, you’re missing half the fun if you go practically anywhere in London, or in England for that matter, and don’t inquire about the history and the personalities who made that history. 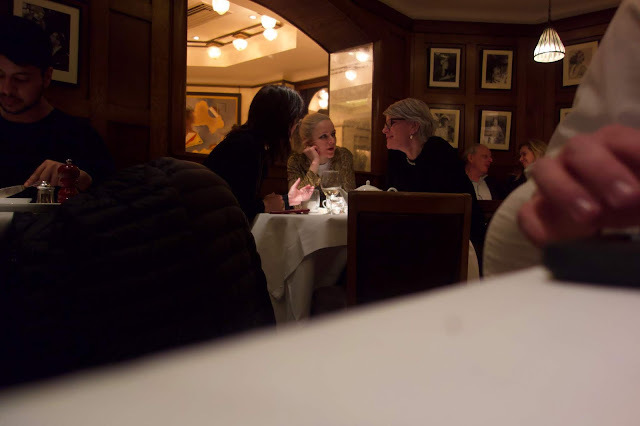 Now it’s time to visit the dining room of this old and very plush restaurant. As you might guess, the diners were all well dressed, as were we, in slacks and sports coats and shoes that would go well with a suit. Nor did we gnaw our food in great ripping chunks and tuck a corner of our yellow cloth napkins into the necks of our shirts. Neither did drinks of the adult sort have an appeal. 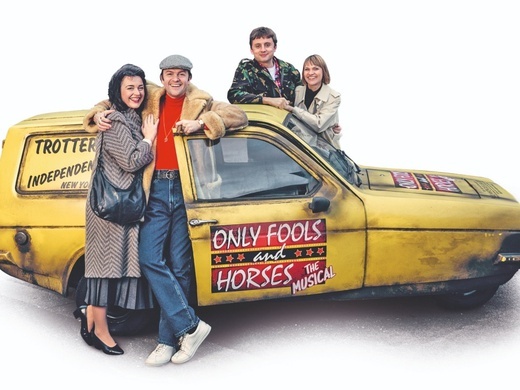 I had already sloshed down two strong gin and tonics before the start and at the intermission of the raucous play we just saw, “Only Fools and Horses,” at the Theatre Royal Haymarket (dating to 1720, third oldest in London). The waiter, dressed in a dark suit, and with the careful elegance of experience, took our drink order and returned to accept our dining requests. I opt for the famous J Sheekey fish pie. Creamy and delicious. 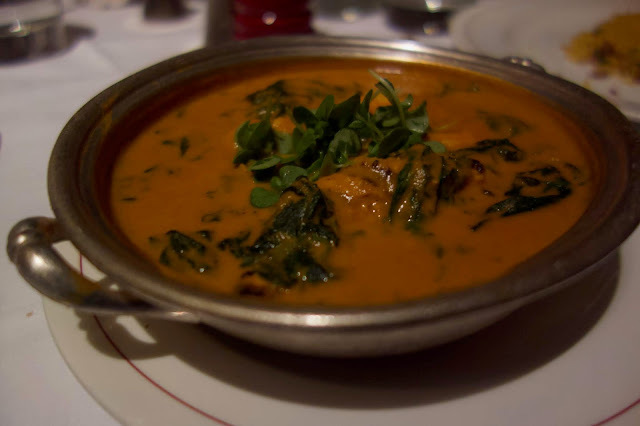 Others ordered prawn curry, flounder, and a bone-in sirloin. I did not get a chance to taste the other dishes as my companions guarded their troughs with angry eyes. 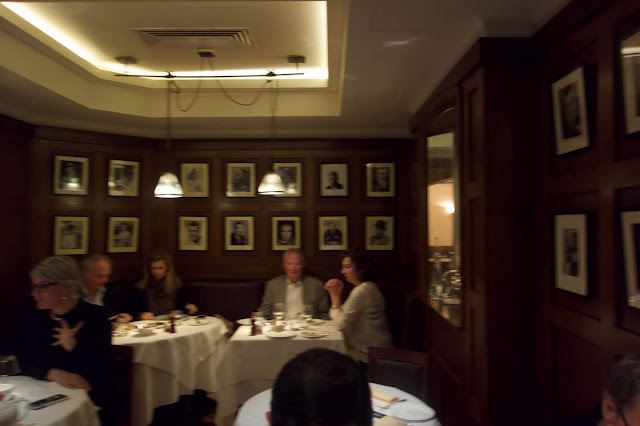 The food was not only wonderful, but the atmosphere felt so upper crust London-ish and yet had the relaxed air that promotes conversation and leisurely dining. Londoners of this ilk speak in hushed murmurs, which make it annoyingly difficult to eavesdrop. Should you get to London and take in a theatre performance, you might consider treating yourself to a luscious after theatre treat at J Sheekey. But, suppose you can’t get there right now. 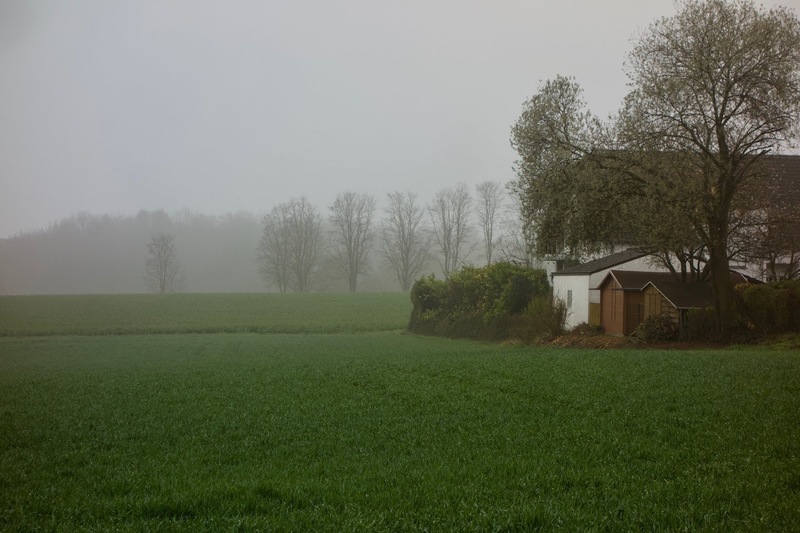 Perhaps your horse is in the running for the Derby, or you simply can’t tear yourself away from Wall Street, or god forgive you if you’re not at the showroom when the new Bentley arrives. 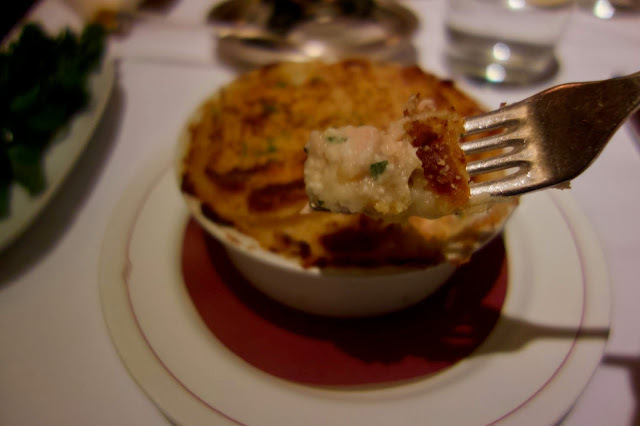 You have my heartfelt sympathy and as a consolation, Madame et Monsieur, I offer you a recipe for J Sheekey’s famous fish pie, that your Cordon Blue trained chef can easily prepare for your late night dinner party. 8 oz Salmon, also cut in 1 inch chunks. Melt the butter over low heat and gently stir in the flour. Gradually add the wine, stirring well. Slowly add the fish stock and stir until the sauce is creamy. Bring to the boil and then simmer for fifteen minutes. Add remaining ingredients, stirring, and very briefly bring the sauce to the boil again. Add more Worcestershire and mustard, if you want it spicier. Season with salt and pepper. Gently stir in the fish and parsley. Pour into a large, high-sided dish, until about an inch from the top. Let the mixture cool. This will allow the topping to sit on the top, rather than blending into the sauce. Mix the milk and butter into the mashed potatoes and stir until soft enough to spread over the fish mixture. Pipe or spread the mash potatoes over the fish mixture. Pop the dish in the preheated oven for 30 minutes. Sprinkle on the breadcrumbs and cheese and bake for another 10 minutes. There it is! An historic taste of London right in your own mansion! But, I’m curious. What color Bentley did you order? I prefer the Cirrus (white) or perhaps the Lustre (gun metal gray) or Tourmaline (an elegant dark silver blue).